1 For compatible smoke detection devices, see also the FPD‑7024 Smoke Detector Compatibility List.2 For compatible NAC devices, see also the FPD‑7024/FPP-RNAC-8A-4C NAC Compatibility List3 If other manufacturers or battery types are used, ensure that the battery or batteries can handle an initial charge current of at least 1.7 A.
Remote4 Eight Form C relay outputs are provided by a D7035 Remote Relay Module. The module connects to the FACP through the option bus. The outputs are fully programmable, exactly as the local relays are programmed. Each output operates independently of the other seven to provide complete flexibility. Communication with the D7035 is supervised. Contact Rating: 5 A at 28 VDCNumber of Modules: two modules maximum. 4 For wiring requirements, see Option bus wiring requirements in the FPD-7024 Family installation and operation guide. 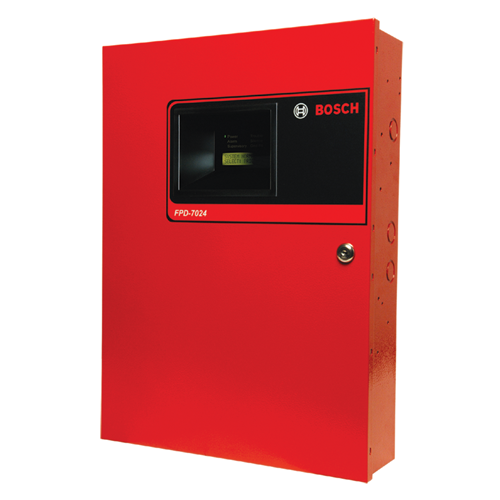 It has four detector zones (expandable to eight) with up to 20 two-wire smoke detectors per zone. It has two NACs on board with a shared internally-regulated 24 VFWR, 4 A NAC power supply. It has two phone or IP communication circuits. Admite comunicaciones bidireccionales en redes Ethernet para paneles de control compatibles. Ocho LED de zona que indican condiciones de alarma. Dos LED indican condiciones de supervisión y otros seis indican condiciones de alarma. Los ocho LED de zona (amarillos) indican condiciones de supervisión. The D7039 enhances the conventional features of the D7024 or FPD‑7024 FACPs by increasing the number of addressable points to 256, the number of relay outputs to 58 on the D7024 or 59 on FPD‑7024, the number of events on the history buffer to 499, and the number of users to 100. The module connects a normally‑open (NO) contact to the multiplex bus of an FPD‑7024, D7024, or DS9400 FACP. The module draws supervised input power from the FACP for use in a Class B configuration. Rotary switches allow convenient address setting. Conecta un contacto normalmente abierto (NA) al bus multiplex de una CDI FPD‑7024, D7024 o DS9400M. Proporciona una conexión local entre los paneles de control compatibles y las aplicaciones aprobadas. This module connects to the FPE-7039 MUX expansion module on the FPD-7024 FACP without using a MUX bus address. It isolates a shorted section on the SLC from the rest of the system to minimize communication loss. La estación manual de una sola acción está homologada conforme a UL y cumple los requisitos de la Ley sobre Americanos con Minusvalías (ADA). La dirección en el circuito de sondeo se configura fácilmente con interruptores giratorios. El asa para tirar hacia abajo se bloquea en la posición activada. Se restablece abriendo la unidad con una llave y volviendo a cerrarla. La estación manual de doble acción está homologada conforme a UL y cumple los requisitos de la Ley sobre Americanos con Minusvalías (ADA). La dirección en el circuito de sondeo se configura fácilmente con interruptores giratorios. El asa para tirar hacia abajo se bloquea en la posición activada. Se restablece abriendo la unidad con una llave y volviendo a cerrarla. The FPC‑7034 adds four Class B or two Class A initiating circuits to the FPD‑7024 FACP. This plug‑in module is automatically recognized by the control panel's firmware when power is restored to the system. It enhances the features of the FACPs. It increases the number of addressable points to 247. It increases the number of relay outputs to 58 on the D7024/DS9400 or 59 on the FPD‑7024. It increases number of events on the history buffer to 499. Al conectarse al bus de opciones de un panel, la FPP-RNAC-8A-4C añade cuatro NAC NFPA 72, clase B o clase A adicionales. Al conectarse directamente a la salida NAC, también es una fuente de alimentación NAC para sistemas de señalización de protección contra incendios. Comunicador de teléfono móvil digital utilizado para comunicaciones IP bidireccionales o de marcación mediante redes GPRS/GSM.